The e-commerce store once appearing at this domain welcomed visitors to its replica Chanel section by stating “Basic Replica provides some of the highest quality replica designer handbags available on the Internet” and “the highest care in manufacturing and quality assurance goes into the production of these Chanel replica handbags.” Despite such assurances, the replica handbags actually sold on this site were easily distinguishable from genuine Chanel goods, and were made from far lower quality materials and with poor workmanship. On this site and others operated by the same persons, many replica Chanel goods were advertised and sold, such as a brown messenger bag with the CC monogram (12.5” X 4.5” X9”) for $220, a Classic Quilted Flap MM Long (10.5”X2.5”X4.0”) in white, pink, grey, blue and black also for $220 and a Calfskin Bag (15”X6.0”X15”) in white, pink and black for $241. 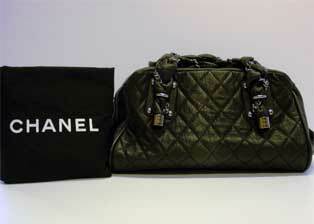 The replica items were sold with fake authenticity cards and serial numbers. Additionally, replica Chanel earnings in black with a white CC Monogram were offered for $17 and a necklace with a hanging CC Monogram for $24. In order to further attract visitors to this website to buy replica Chanel and Louis Vuitton handbags, a number of specials were offered. For example, if a customer bought 2 items she would get a 25% discount on the 2nd Item. If 2-4 items were purchased, the customer would get a 25% discount on then 2nd, 3rd & 4th items. Finally, if a customer bought 5 items or more, she received a 25% discount on all of the items.